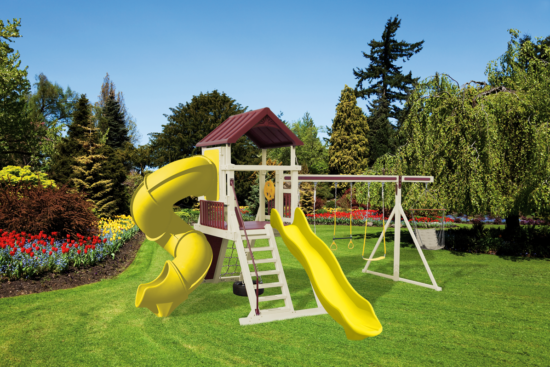 Our A-1 Standard Climber swing set offers a flexible foundation for play at a great value. This playset comes standard with rung climbers to the tower, and a three position climber swing beam. This swing set include a belt swing, baby swing, and trapeze. If that's not enough visit our accessories section for other optional parts. Your children will spend hours playing on this adventure climber, thrill-seekers and easy-goers alike! Features a single play tower with 5’ x 5’ deck, 5’ rock wall, cargo net climber, 10’ Avalanche slide, 7’ Turbo Twister slide, 4-position swing beam plus additional space to hang a 4-rope tire swing, and flat step ladder.